The default theme is used, without a persona. The userChrome.css and userContent.css files are ignored. The default toolbar layout is used. The status of plugins is not affected. Custom preferences are not affected. Safe Mode also includes a number of troubleshooting options that allow you to make certain changes upon restarting your Mozilla application (see below). To enter Safe Mode in previous versions (or if you can't open your Mozilla application to use the Help menu) you must first make sure Firefox/Thunderbird/SeaMonkey is not running in the background (including all windows like the Download Manager that open in a separate window) before following the instructions given below. Use one of these methods to start your Mozilla application in Safe Mode. This should not be confused with restarting the computer in Windows Safe Mode! In older versions, use the "Mozilla Firefox (Safe Mode)", "SeaMonkey (Safe Mode)", "Mozilla Thunderbird (Safe Mode)", or "Mozilla Thunderbird (No Extensions)" shortcut in the Mozilla Firefox, SeaMonkey, or Mozilla Thunderbird program folder on the Windows Start Menu. Adjust the path accordingly based on the actual installation directory (e.g., on 64-bit Windows, use "Program Files (x86)" instead of "Program Files") or if you installed your Mozilla program in a different location than shown above. If you have installed the application to another location, modify the path as such. It's the "-safe-mode" command line parameter that's crucial here. All extensions will be disabled. You will still be able to select them in the Add-ons/Extensions list but only for the purpose of upgrading or uninstalling (the options button will be disabled). Default toolbar settings and controls will be used. The default theme will be used. 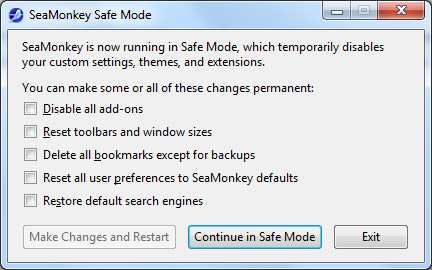 A window called "Firefox Safe Mode" or "SeaMonkey Safe Mode" with some troubleshooting options appears (see below). At that point, you can either continue to Safe Mode or select some troubleshooting options and restart in normal mode to apply the changes. All extensions will be disabled (but this will not reset any preferences that some extensions may modify). Firefox or SeaMonkey will be using the default theme. Default toolbar settings and controls will be used . If you choose any of the troubleshooting options, the changes are only applied if you choose Make Changes and Restart. Start in Safe Mode - This will run Firefox in Safe Mode without making any changes. Refresh Firefox ("Reset Firefox" previous to Firefox 35) - This will reset Firefox to a default state by creating a new profile, migrating only essential data (bookmarks, browsing history, passwords, cookies, and form-fill data) and then moving all of the old Firefox data to a folder on the desktop. Warning! This change cannot be reversed without manually transferring the old Firefox data back to the new profile. Disable all add-ons - Disables all themes and extensions; starting in Firefox 3.5, this option also disables all installed plugins. To reverse this change, use the Add-ons Manager to selectively re-enable each add-on when you restart Firefox (details here). Reset toolbars and controls (Firefox, Thunderbird) or Reset toolbars and window sizes (SeaMonkey) - Removes any toolbar customizations you may have made via the "Customize Toolbar" dialog. Also restores default window size/position and tree sort order and resolves various localstore corruption issues. Warning: Unless you made a backup copy of localstore.rdf, this change cannot be reversed without re-customizing your toolbars. Delete all bookmarks except for backups (SeaMonkey or Firefox 3.6 and above ) or Reset bookmarks to Firefox defaults (Firefox 3.5 and below) - Replaces your bookmarks with the default set of bookmarks (your browsing history is left intact). If you select this option and want to undo the change, you will need to restore your bookmarks from backup. Reset all user preferences to (Firefox or SeaMonkey) defaults - Resets any user-set preferences to the default values (except for those set in the optional user.js file) and restores the default theme. Does not affect any userChrome.css or userContent.css changes. In SeaMonkey, selecting this option is not recommended because it removes all Mail and Newsgroup Account settings and access to saved mail will be lost for those accounts. Warning: This change cannot be reversed unless you made a backup copy of the prefs.js file. Restore default search engines - Adds back all of the default search engines included with your version of Firefox or SeaMonkey, if some are missing. It does not remove any added search engines and you can later remove any unwanted search engines that were added back. Make Changes and Restart - This restarts the application in normal mode and applies permanent changes in any of the options selected above. Continue in Safe Mode - Starts the application in Safe Mode (this will not apply any of the options selected above).